At First Choice Overhead Doors, we can show you a wide range of door style choices ranging from contemporary, traditional or country. With our help, you’ll find the perfect garage door for not just your budget but your taste and your needs! Here at First Choice Overhead Doors, we specialize in providing the kind of high quality customer service that keeps our clients happy. Our team of dedicated employees can repair any garage door opener or garage door out there, and we take pride in the countless number of precise and expert installations they have under their belt. Our team of installation experts and technicians have years of experience working with the Garaga brand of garage doors. They have the highly-developed skills and expertise that can ensure your installation goes smoothly each and every time, showcasing just how superior our garage doors are. Start designing your dream garage door today! A high-quality garage door can contribute to your home’s curb appeal in a major way. The wrong decision can be disastrous, and that’s why Garaga created a tool to ensure you’re making the absolute best choice for your home and family. Thanks to our cutting-edge Design Centre, you can both create and design the garage door that will match the style of your home and fit exactly with your vision. 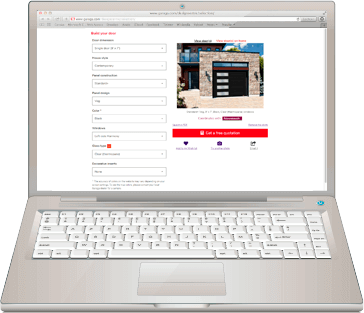 Begin with your choice of door models from several options, choose the colour you want, and then finish off your design with any number of accessories like door knockers and windows. Shopping for a new garage door? listen to what the experts have to say! There are an overwhelming number of products out there to choose from on the market, but you can rely on our countless years of garage door experience. We’re confident that we’re the best in the business when it comes to knowledge about garage doors. Our team of skilled employees at First Choice Overhead Doors will provide you with a guided purchase process, all while keeping your needs, your budget, and your taste in mind. We’ll ensure that you understand each and every possibility and product we offer, how to make sure your garage door has the best insulation for your needs, and provide you the widest and most practical range of accessories to personalize your door! At First Choice Overhead Doors, we are proud to offer our customers the very best products available on the market today. These products aren’t just durable and efficient but safe as well, and LiftMaster garage door openers fit the bill every time. LiftMaster garage door openers and their operating systems are reliable and keep you and your loved ones safe, ensuring that your garage door closes properly every time. Thanks to the Internet, you can even open and close your garage door anywhere you are across the globe from a computer, tablet, or smartphone. Garages aren’t just the best place to park your car to keep it out of the rain or keep it safe at night. They’re also one of the most well-used routes into and out of your house, and this means that any homeowner with a garage door will open and close it to step into and out of their house on foot. This means you need to check your door’s operating system regularly to ensure it’s working well. 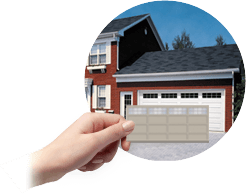 With our garage door specialists here at our First Choice Overhead Doors Vaughan, ON location are proud to offer you our annual maintenance program: a 10-point process that involves not just visually inspecting your door but ensuring that all its moving parts are lubricated. Not only that, our dedicated staff will make any minor adjustments needed, ensuring that you’ll never have to worry if your door is working the way it should.